Will University and College Students Join the "Fight the Flu" Resistance? Efforts to curb swine flu in Ontario are still in full swing. With the second wave of H1N1 infection believed to be over, we're left wondering if there will their be a third before winter sets in. Nationally, about 40% of Canadians have been vaccinated, but we're not out of the woods yet. With that in mind, the government of Ontario is investing $650,000 in an ad campaign that's targeting the most susceptible demographic - college and university students. Close to half of those hospitalized in Ontario are under 20 years of age and people aged 17-24 are also amongst the least likely to get seasonal flu shots (source). 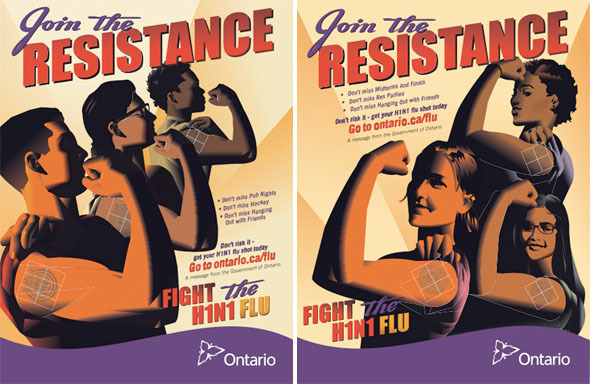 The campaign (which plays on the theme of military recruitment) includes ad posters that will be strategically placed in dorms, bars, and restaurants in and around Ontario's colleges and universities, and an online blitz to spread the word and draw students to specific H1N1 vaccination info online. Is this money well spent? Do you think the "join the resistance" approach will be effective? What are your thoughts on the ad campaign?